When a city decides to locate itself on a ridge for its salubrious climate it has to do many things to access water from rivers which flow a long distance away. Such is the case with Bangalore. With multiple- sourcing of water a reality managing shortages becomes a clear case of involving citizens as part of the solution. The city water utility has made rainwater harvesting compulsory for all new buildings with a site dimension of 1500 square feet or above where new water connections are sought and for all old buildings where the site area is 2400 square feet or above. The deadline for the implementation is the 31st of December 2011. 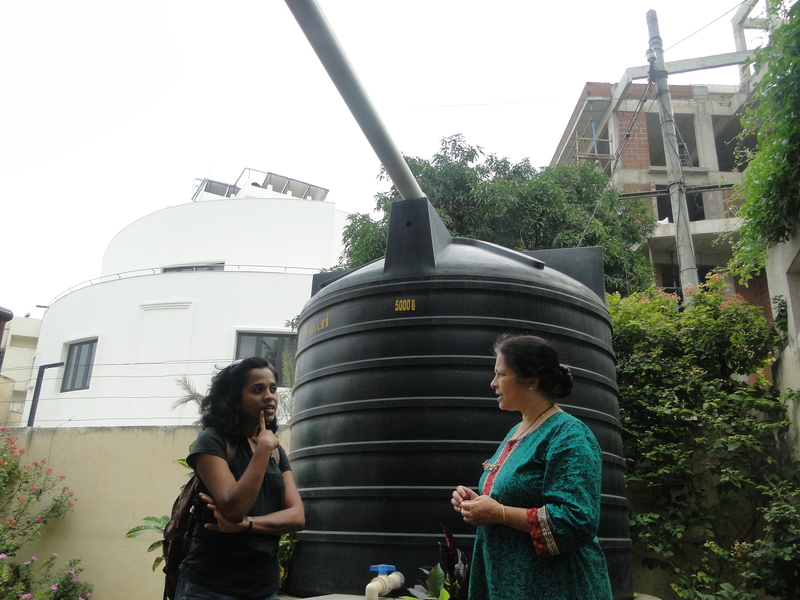 According to the utility -the Bangalore Water Supply and Sewerage Board – the target for such households to have done rainwater harvesting was 55,000. Of the target at the last reported call 27,572 homes and apartments had already completed installation and had furnished to the BWSSB a certificate of having done so. This is an impressive 50 % achievement of target. It is likely that much more people have implemented the systems but are in the process of submitting the certificates to the BWSSB. In addition to the above about a 1000 new connections are given every month by the utility. Of these nearly 50 % may qualify as having to do rainwater harvesting. Every year therefore an additional 6000 homes/ apartments and layouts are mandatorily doing rainwater harvesting. Beyond the mandate are people with an interest in the issue of sustainable water. They have been adopting rainwater harvesting to fill their sump tanks, store water in rain barrels or recharge their open wells and bore wells. This number is not being counted but with experience one can say that this may be close to another 30,000 homes. Citizen Initiatives: Take the case of the Pandits on Hayes road. They have installed what one would call the ‘mother of all rain barrels’, a 5000 litre HDPE tank which picks up part of the roofs water and stores it. They agree that it is music to the ears when it rains and the tank starts filling up and it breaks their heart to see the water overflow and spill over. They have adopted rainwater harvesting not because they have a water shortage or because it is the law but simply because they thought it was the right thing to do. Such good people are a plenty in Bangalore. Material availability: A visit to the bustling SJP road is a revelation of how the ‘market’ for rainwater harvesting has matured and developed. Many of the hardware shops display rainwater harvesting filters and other equipment where plumbers can buy at a competitive price. The manufacturers of concrete rings for wells report a steady increase in business with many buyers approaching them for recharge wells. Plumbers and well diggers have seen a spur in their business as have small consultants who specialise in better water management systems. The rainwater theme park in Jayanagar set up by the BWSSB , sees a steady stream of visitors who are particularly piqued by the recharge well and how easy it is to allow clean rainwater to infiltrate into it. The city can be proud to have the second largest number of urban rainwater harvesting structures after Chennai and having the country’s first rainwater theme park with great facilities for user education and interaction not only on rainwater but with water conservation, reuse and recycling as well as understanding groundwater and rainfall in Bangalore better. With constant persistence by the authorities, with quality work on structures and a skill up-gradation programme for the workers it will be possible that each and every house becomes a rainwater harvesting structure easing the cities thirst a bit. Concurrent convergence on tank restoration works and improving the piped water network and sewerage network can help the city meet the ever increasing populations demand for safe and sustainable water. You are currently browsing the Harvesting Rainwater blog archives for August, 2011.